The Eagle County Coroner’s Office investigation into human skeletal remains found Thursday in Vail and Edwards will continue Saturday with the help of detection dogs trained in finding human remains. Investigators will continue searching for more skeletal remains in Vail on Saturday (David O. Williams photo). 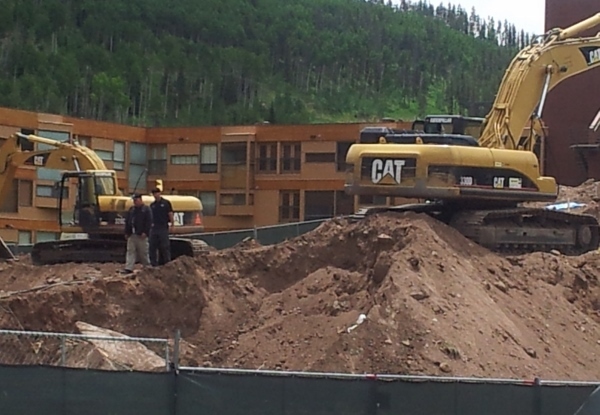 A partial skull was found Thursday by a construction worker dumping debris from a Vail condo redevelopment project at a soil collection site in Edwards. Those remains were traced back to the Lionshead Inn redevelopment project in Vail, where an additional large human bone was found. While retrieving the skull in Edwards, officials also recovered a jawbone and four vertebrae, but no additional remains were found in Vail on Friday. Dr. Melissa Connor, archaeologist and associate professor of forensic science from Colorado Mesa University, is working with Eagle County Coroner Kara Bettis to scrape and sift through soil at the redevelopment site. Bettis is trying to determine the age, gender and identity of the remains. Friday’s search area was adjacent to the South Frontage Road in Vail and outside of the footprint of the two demolished condo/hotel buildings on the site that were constructed in 1973 — the Lionshead Inn (formerly L’Ostello) and the Vail Glo Best Western. Officials from the Vail Police Department, Colorado Mesa University in Grand Junction, Colorado Bureau of Investigation, Colorado Fifth Judicial District Attorney’s Office and the Eagle County Sheriff’s Office assisted in Friday’s investigation, which will continue Saturday. Construction on the new condo and commercial project on the site called The Lion has been suspended.